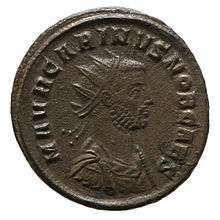 A Roman radiate produced in 283 depicting Emperor Carinus. From the collection of York Museums Trust. Historians differ on what then ensued. At the Battle of the Margus River (Morava), according to one account, the valour of his troops had gained the day, but Carinus was assassinated by a tribune whose wife he had seduced. Another account represents the battle as resulting in a complete victory for Diocletian, and Carinus' army deserted him. This account may be confirmed by the fact that Diocletian kept in service Carinus' Praetorian Guard commander, Titus Claudius Aurelius Aristobulus. ↑ In Classical Latin, Carinus' name would be inscribed as MARCVS AVRELIVS CARINVS AVGVSTVS. 1 2 3 4 Leadbetter, William. Carinus (283–285 A.D.). ↑ Spence, H. Donald M. (2003). Early Christianity and Paganism. Kessinger Publishing. pp. 391–392. ISBN 0-7661-3068-1. ↑ Southern, Pat (2001). The Roman Empire from Severus to Constantine. New York: Routledge. p. 133. ISBN 0-415-23944-3. ↑ Pohlsander, Hans A. (1996). Constantine. Routledge. p. 6. ISBN 0-415-31938-2. ↑ Varner, Eric R. (2004). Mutilation and Transformation : Damnatio Memoriae and Roman Imperial Portraiture. Brill Academic Publishers. p. 212. ISBN 90-04-13577-4. This article incorporates text from a publication now in the public domain: Chisholm, Hugh, ed. (1911). "Carinus, Marcus Aurelius". Encyclopædia Britannica. 5 (11th ed.). Cambridge University Press.